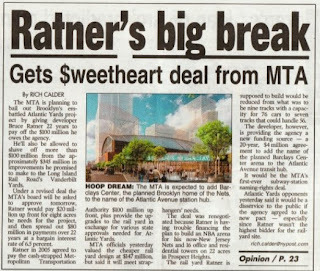 Rounding up the coverage: several news outlets get the "sweetheart deal"; Post columnist calls it "outrageous giveaway"
Several of the articles, in their headlines, telegraphed the essence of the deal, which NLG describes as "Acting Governor Bruce Ratner directs MTA to bailout Acting Governor Bruce Ratner." The New York Post, in an article (on page 16) headlined RATNER'S BIG BREAK: GETS $WEETHEART DEAL FROM MTA, captured items 1-4 and 7. The Brooklyn Paper, in an article headlined So here’s the deal: Ratner to get huge break from MTA, included items 1-4, and 7. The Architects Newspaper, in a piece headlined Be My Sweetheart (Deal), included items 1, 3, 4, and 7 . A Reuters article, headlined NY MTA may ease developer's Atlantic Yards terms, included items 1, 3, 6, and 7. The New York Daily News, in an article (placed prominently on page. 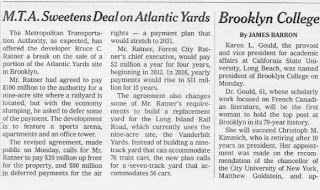 6) headlined MTA lets Atlantic Yards developer Bruce Ratner go on the installment plan, got items 1, 3, 4, and 7. The New York Times, in a pathetically small print article (on page 22; below) headlined M.T.A. Sweetens Deal on Atlantic Yards, got only items 1 and 3. In CityRoom blog coverage, headlined, Developer Seeks to Defer Payments on Atlantic Yards Site, the Times did somewhat better, adding item 6. Crain's, in an article headlined MTA gives Atlantic Yards developer breathing room, got items 1, 3, and 7, as did an AP article, headlined New Brooklyn arena deal unveiled. The New York Observer was straightforward but pointed. In a blog post headlined Ratner To Pay $180 M. Less Upfront For Atlantic Yards, it was the only publication to quantify the sum in the headline. The short piece included items 1, 3, and 4. IT looks like the Metropolitan Transportation Authority is moving in a "new direction" -- just as Gov. Paterson demanded last month. At a meeting yesterday, the new MTA management sacrificed the interests of straphangers and the local economy -- to support the politicians' favorite "economic development" boondoggle, the Atlantic Yards development in Brooklyn. 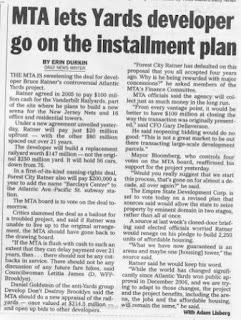 Developer Bruce Ratner wants to renege on his deal with the MTA -- and the MTA is going along with it. Remember, the MTA is so cash-strapped that it had to beg the state for a permanent $2 billion-a-year bailout a couple of months back. Yet now, in effect, it's proposing to lend money to a speculative developer at a 6.5 percent interest rate for decades. That rate is laughable -- market-rate financing is unavailable at even twice that rate. She also cited a loss of tens of millions of dollars in lost value in the railyards. Is the bad economy at fault? Ratner blames litigation. Gelinas, perhaps mindful that the developer has been seeking a new deal since at least September 2007, when the City and State Funding Agreements were signed, suggests that Ratner has been at the wheel, trying "to get everyone else to take on the usual financial risks of a development project -- the risk that the economy would sour, the risk that the project couldn't raise money and so forth." The MTA should have flatly recommended yesterday that its board think of Forest City's new proposal as yet more wasted time -- and tell the company it's got a month to come up with what it originally promised or the MTA would go out and find a better deal. After five years of delay, the MTA instead wants its board to approve the giveaway plan tomorrow. The board should vote it down and start from square one in finding a responsible deal for its valuable land, as is its legal duty.